As I sit at my desk, typing this post, I cannot believe it has been 9 months since we launched the digital health demonstration centre in China with a suitably impressive fanfare. At the time we decided we’d be reviewing how the project has fared in March. (Read all about the background to the demonstrator project). So here is the assessment. The demonstration centre was originally set up as a fixed exhibition in Ningbo City in collaboration with the government of Zhejiang Province to give British companies wanting to do business in China a place to showcase their services. There it remained from June 2014 until December 2014 when we decided we should take the demonstrator on tour at the start of 2015 to see how other parts of China would respond. 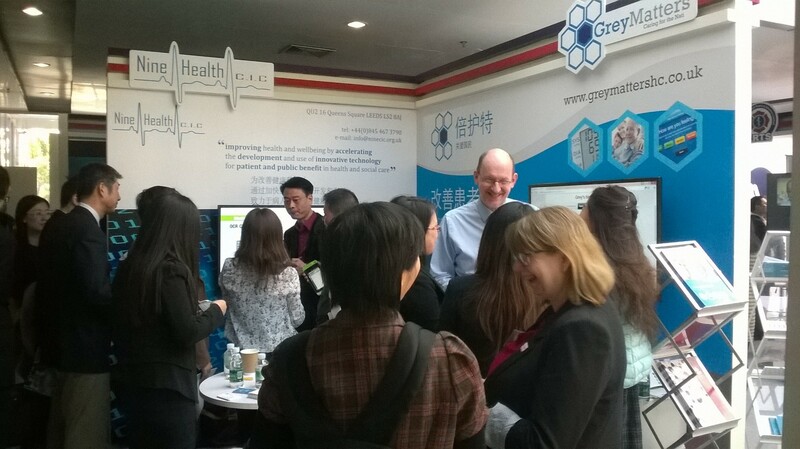 I’m just back from a week-long trip to China with our now-travelling demonstrator, where ten delegate companies in the healthcare sector used the centre to interact with a range of private and public sector professionals. For some of them it was a return to China to reconnect with potential business partners, and meet up with people who had already shown interest in possible collaborations. For others it was their first time in China, and was a chance to make initial connections, as well as to learn about potential markets. For all, it was another enlightening, challenging and thought-provoking trip which took in three centres, and a variety of styles of interaction from large scale seminars to face-to-face ‘speed dating style’ meetings. We began in Beijing before making three hour flight to Guangzhou, and then moved on to Hong Kong. From my perspective, one of the most successful and interesting parts of the trip was our visit to the very impressive Biotech Island in Guangzhou. It was my first trip to the island – a purpose built science park which has become one of the main centres for technology and research in China – and I was incredibly impressed. It’s a fantastic destination, and has become a key location for new businesses to set up offices. We spent two very productive days on Biotech Island, presenting to and hosting around 150 visitors at the demonstration centre each day. Following the Biotech Island leg of the trip, we jetted (merely a figure of speech as some of us took the bus which was an interesting experience) to Hong Kong for another new experience – an intense day spent meeting up with specially selected health professionals in what we called our ‘speed dating’ section. There were thoughts before we arrived that Hong Kong might be too advanced in terms of digital healthcare to generate sufficient interest there. That turned out NOT to be the case, and the innovation shown by the UK delegates attracted plenty of attention. And I’m delighted to be able to report that one of the companies we have helped do business in China has already signed a deal to develop its digital portfolio. Nine Health CIC is a ‘Big Data’ expert, and was among the delegates on the first demonstration centre trip back in June. The CEO of social enterprise Nine Health, Elaine Taylor-Whilde, tells me that after nine months of intense work and negotiations, this latest trip to China culminated in the launch of a pilot project to bring ‘intelligent information systems’ to the Zheijiang Province GPs. Elaine’s story is a lesson in commitment and persistence. She was approached by major provider of digital health solutions, Lantone, during her first trip to China, and they immediately expressed an interest in collaborating on a project they were already working on. They needed a ‘Big Data’ expert with a specialism in healthcare – so that was a great fit. Elaine says she’s made several trips to China – which is a huge time and financial investment for her and her company. She also welcomed managers from Lantone to the UK in October, which seemed to seal the deal. She says she received vital help and support from UKTI and Healthcare UK in terms of the best ways to do business with China – especially in terms of how to interact socially, and the best ways to carry out delicate negotiations. Nine Health now has a representative in China and a base in Hangzhou to oversee the year-long pilot project – though Elaine expects to make regular trips before the system is ready to be marketed. This kind of success story shows us that the demonstration centre and the other work we are doing to promote the UK’s digital healthcare expertise is really beginning to pay dividends. Doing business in China can be a long process. It can be challenging and the investments needed can be off-putting – but as Nine Health and others have shown, with the help or organisations like Healthcare UK, the rewards are there for those with the talent, innovation and persistence to make things happen.